The team wanted to use the robot to transform complex 3D designs from concept to physical reality in machine foam and other soft materials. Carnegie Mellon University (CMU) is a global research university with campuses located in Pittsburgh, Qatar and Silicon Valley. The Carnegie Mellon School of Architecture in Pittsburgh has consistently ranked in the top ten professional architecture degree programs, with a reputation for being “THE” architecture school and for constantly experimenting with different technological applications and techniques. In 2007, CMU Associate Professor Jeremy Ficca founded the School’s Digital Fabrication Lab (dFAB) to provide a venue through which students and faculty could gain experience with the new reality of advanced digital design and manufacturing processes in architecture. 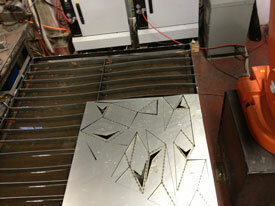 The Lab acquired a 6-axis ABB IRB4400 and added a rotary table as an integrated 7th axis. The team wanted to use the robot to transform complex 3D designs from concept to physical reality in machine foam and other soft materials. With the robot cell in place, it quickly became clear that the challenge of its programming would be the limiting factor - the creative projects inspired by the Lab required programming that would take too long to generate or was simply impossible to program manually. dFAB began to search for the best tools and methodologies to quickly and accurately deliver their projects with the robot. The Lab was already using Mastercam’s computer-aided manufacturing system to run their 3-axis CNC router – could the CAD/CAM (Computer Aided Design/Computer Aided Manufacturing) methods with which they were already familiar serve them on the robot cell? They discovered that with ROBOTMASTER, the answer was “yes”. As a robot programming package integrated into the Mastercam CAD/CAM environment, Robotmaster would be able to create 6-axis robot program code off-line, directly from CAD design files, with the same speed and efficiency usually associated with CNC machine programming. Robotmaster’s familiar interface and features would enable staff and students to quickly learn to create milling programs for the robot cell. With telephone and internet support by Robotmaster’s technical team, dFAB staff were quickly able to set up the software and configure it for their system. After only two days of on-site training, they were fully comfortable designing with the software on their own and cutting their own parts. The Robotmaster team rated their performance as undoubtedly “better than average” - the dFAB group had “done their homework” ahead of time to focus on the mission critical aspects of their integration with the trainers. dFAB has never looked back - Robotmaster has been delivering consistently since its installation, enabling the Lab to leverage its creativity by machining designs in soft materials quickly, accurately, and effectively. The original robot and rotary table installation has been expanded to include an automatic tool changing system with a tool holder, a vacuum table and a quick changing robot flange to change from spindle to gripper, all supported by the versatile programming provided by Robotmaster. The CMU School of Architecture staff are unusually innovative and technologically advanced users of Robotmaster and have developed a special relationship with the Robotmaster team. Robotmaster’s Tyler Robertson notes: “They fully understand not just the path results generated through Robotmaster, but how it is performing calculations. The fabrication and manufacturing knowledge displayed by the faculty has been superb: they are among our unofficial Robotmaster super-users.” dFAB’s successes in using the robot for milling architectural part prototypes and in paving the way for new and innovative manufacturing technologies have been inspirational to both parties. Robotmaster seamlessly integrates robot programming, simulation and program generation using industry proven CAD/CAM tools typical of CNC Manufacturing. Optimized and error-free programming for such tasks as trimming, 3D machining, de-burring, polishing, welding, dispensing, grinding and painting. Total programming time for one workpiece, including the time to import a CAD file and create a toolpath, was reduced from 12 hours to only 3.5 hours. Adding a robotic system enabled Groupe Gravel, a metal fabricator, to profitably automate cutting and welding for high-mix short-batch production. Robotmaster's tools enabled automatic path creation from CAD models drastically improved programming time. 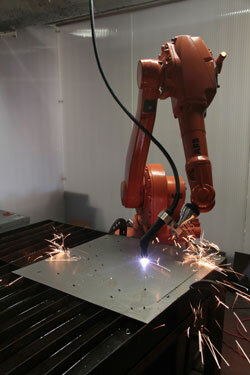 We have a new suite of specialized tools for cutting and welding which we will be demoing at Fabtech.